By Jeanne Eason April 5, 2019 Community, Durham, N.C.
March 21 is World Down Syndrome Day (WDSD). Since 2012, the United Nations has officially observed this global day to advocate for inclusion of those with Down syndrome. This year, LeChase’s Durham team took part through the Rock Your Socks initiative. 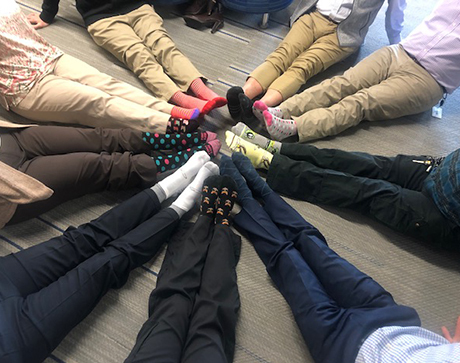 Employees were asked to wear lots of socks – but not just any socks. The Rock Your Socks effort encourages people to wear brightly colored socks, long socks, printed socks, mismatched socks, a single sock… or even three socks to symbolize the triplication of the 21st chromosome that causes Down syndrome. Even people who normally don’t wear socks were encouraged to wear them! Rock Your Socks serves a dual purpose: Crazy socks can be conversation starters to raise awareness of Down syndrome; they are also a reminder that what’s different is still beautiful and wonderful. Thanks to everyone who helped send the message that differences are meant to be celebrated.